Ford Fiesta in the flesh; Mazda2, too. 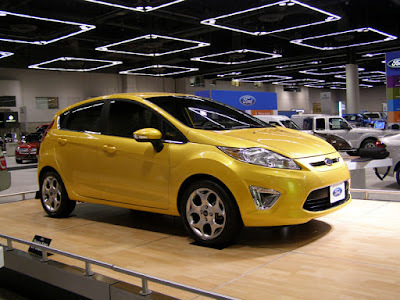 I attended the Portland Auto Show last week, and caught a glimpse of the upcoming 2011 Ford Fiesta and 2011 Mazda2. 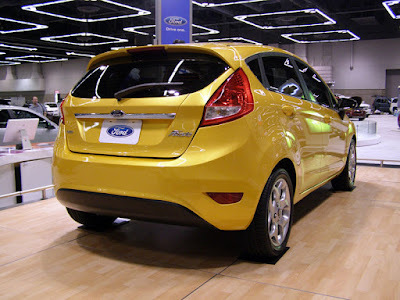 Fiesta: Although not usually a fan of yellow vehicles, "Yellow Blaze Metallic" looks really good on the Fiesta. You can see the chrome inserts in the lower fascia, and they looked better in person than in photos. 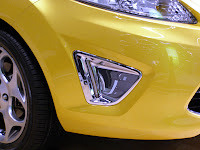 I just think this is such a sharp car; it should sell very well. 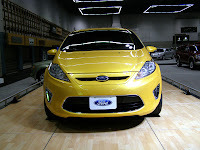 Ford Sales Analyst, George Pipas, said Ford has more than 4,000 pre-orders for the car. Pretty impressive since none of those pre-orders has had a test drive in the vehicle yet! 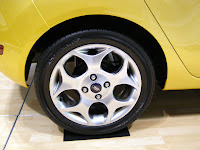 The Fiesta will hit dealerships this summer. 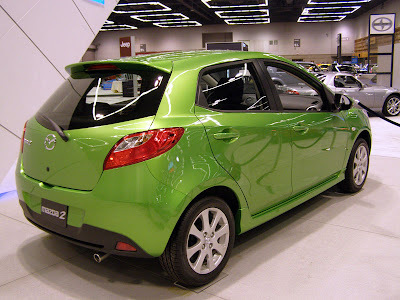 Mazda2: Also at the Portland Auto Show was the Mazda2. The 2 allegedly shares a platform with the Fiesta, but that's where the similarity ends. However, the Mazda2 also looks good in person. Although not quote as edgy looking as the Fiesta (at least in this trim level), the 2 is still very appealing—"2" thumbs up. I was there for the media preview, and they were setting up a fridge with Mazda2 "Zoom Zoom" energy drink; just in case you wanted to know. 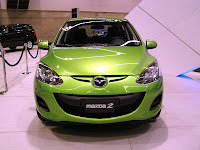 The 2 gets the Mazda corporate "happy face," although not to the extent of vehicles, such as the new Mazda3. This car should prove to be another competent entry into the U.S. b-segment. 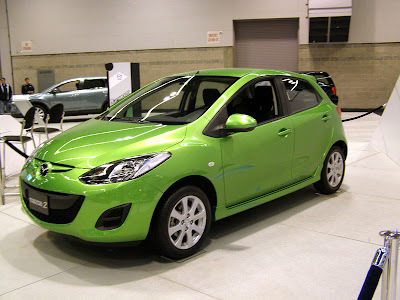 The Mazda2 is also available this summer. The Ford definitely looks better than the Mazda to me. Hmmm.. such nice lines! I like it when companies make their smaller cars look more... "aggressive"... it makes them stand out. I love both of them and the colors for each one are fantastic.The Fiesta paint colors in particular are excellent.The Mazda 2 or Demio is more curvy and "beetle-esque" than the more restrained but still attractively futuristic looking Fiesta.The majority of the interested tuner crowd,the eccentrics, and the Mazda loyalists will go for the 2.The Ford will entice a lot of people looking for a truly cool domestic subcompact and those who want a second car who are already Ford owners.It's about time North America received more funky small cars from Europe and Japan.